Installing Pendants in Kitchen, Livingroom, Dining room, Etc.! Get the tools you will require, including Philips and flathead screwdrivers. You will need a pair of pliers, electrical tape, and wire nuts as well. If you have a voltmeter, bring it too. You’re also going to need a ladder. 2. Switch Off the Power! Once you have your tools and a ladder, flip the switch on the breaker board that powers the light fixture you’ll be replacing. It should be labeled, but if it isn’t you have two options. The first is to switch all the breakers off.The second option is to screw a lightbulb into the existing fixture, turn on the light, and flip breaker switches until the light goes off. Then you’ll know which breaker powers the wires going into the existing fixture. But, this may require you have someone help you so as to not be going back and forth from the breaker panel to the room with the fixture you are replacing.The only one thing you can really do wrong when installing a pendant light fixture is failing to turn off the electricity. If you fail to turn off the electricity, you’ll get a shock! Before you can install a pendant light fixture, you will have to remove the existing light fixture. If there isn’t one, you are already half finished with your installation!To remove the existing fixture, get up on the ladder with a screwdriver and remove the two screws bracing the fixture to the ceiling. It could be a Philips head or flat. Once you have the screws removed, slowly remove the fixture to expose the wiring. You will see two sets of wires. One is the power wire and the other is the return. It is irrelevant which wire is which. Unscrew the wire nuts connecting the power wires to the wires running into the fixture.If you have a voltmeter, check to make certain there is no electricity running through the wires. If there is, you’ve flipped the wrong breaker switch. Once you have the wire nuts off disconnect the wires of the existing fixture from those coming out of the ceiling. Set the old fixture aside. 4. Connect the Pendant Light Fixture! Connect the pendant light fixture wires to the wires from the ceiling. Take two wires — one of the pendant fixtures and one of the wires from the ceiling — and hold them parallel. With the ends of the two wires touching, slip a wire nut over the top of them. Then, twist the wire nut until it is covering the ends of the two wires tightly.Then, put a wire nut on the other two wires using the same process. Once you have the two wires from the ceiling connected to the two fixture wires with wire nuts, wrap electrical tape around the nuts. Wrap the tape around the nuts and down over the wires a few inches as well. Then, stick the wire nuts up into the electrical casing in the ceiling.Once the wires are up in the electrical casing, hold the pendant fixture up to the casing. Align the screw holes in the casing with the screw holes in the fixture. Once they are aligned, screw two screws into the holes to affix the fixture to the ceiling.Now that you have the pendant fixture installed, you can screw a lightbulb into it. Then, go turn the breaker switch back on as well as the light switch for the room the pendant fixture is in.If the light does not come on, check the bulb first. Screw it into a different fixture to make sure the bulb isn’t bad. If the bulb is working, switch the breaker switch several times. Unless you have faulty wiring or you failed to connect the wires correctly, the issue should be the bulb, the light switch in the room, or the breaker switch.Once you have light, you’re finished with the installation! At Chester Lighting we have hundreds of pendant lights fixtures on display in our beautiful showrooms throughout New Jersey. 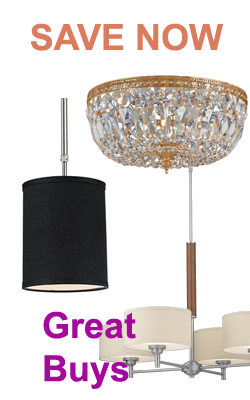 Check out our selection of modern and traditional pendant lights.